I just pulled the trigger on a new Canon EOS-M and here are 7 reasons for my actions. If you want a cheap APS-C camera for video you can find it here. The EOS-M was launched with an $800 price tag, which is ridiculous seeing as it shared almost identical features with cheaper rebel cameras. But with the camera being discontinued and Black Friday and Cyber Monday deals hitting, I got an EOS-M Body for $244 on Amazon which was a no brainer. I am always looking to minimalize my podcasting setup. As someone who shoots all his videos from an apartment in Chicago, it is crucial that I keep things efficient. Time is money, and if I can spend less time fiddling setting gear up, I can spend more time producing content. So my new setup will be the EOS-M with an EF adapter (found a great knock off for $60), an AC power chord so I don’t have to deal with batteries and a small tripod with a monitor. I will do a video on the setup in the future. I was recently invited to do a short live Q&A session with Duy Linh Tu and while checking out his videos I found this one where he mentioned the lower price tag of the EOS-M. That video coupled with the crazy recent price drop on the EOS-M had me pulling the trigger. So I place a lot of the blame on Duy. Thanks man! I would love to have a third camera for use on shoots and for my podcast. I would really like to have two angles for my videos and I really need three cameras to do that (one camera is usually in my hand). At the moment I have a 6D and a 5DmkII (sold my 7D) and they are great, but having an APS-C sensor in your kit is so nice for lens/angle flexibility. Having a small, sub-$300 camera is really nice for dangerous shooting. If I need to put a camera somewhere precarious or tight, I’m now set. $250 is easier to replace than a $1500 DSLR. Moments away from buying a 70D, should I save some cash and get this? This would be my primary camera at the moment. @nick_buckley:disqus , I’ve been using this as my primary for several months. As someone just getting into DSLR from camcorders, I’ve enjoyed it. Was hard to pass up for $300. Oh man, that is a tough one… I don’t think I could deal with this as my sole camera. I think you would be much happier with the 70D. The size, ergonomics, killer dials and flip out screen make it a GREAT first camera. This little EOS-M would take a lot of rigging to make it work well. And the best part….you can add Magic Lantern to this. I always wondering of using Magic Lantern to this camera, please make a review of it if you don’t mind. I’m planning to buy this too soon. Oh really? That’s not good. I heard they released a firmware update to fix the slow autofocus, but if you cant install ML on this now….man, I dunno. The price is good, but nex is a good competitor. I don’t own one, but it has an articulating screen, less crop, and the adapters for old lenses are cheaper. I’m going to have to sit down and figure out if the price difference is worth it. and there is some, there is a adopter for Canon FD lenses only the movie mode does not work anymore. Hi, the ML for EOS M is outdated, sorry about that. I have a Canon eos M , I saw there is a Magic Lantern software for it, only I can’t find it on your download v2, should I use another software? Caleb, I truly appreciate everything you offer us with dslr shooter. You are my go to for reviews and advice on a daily basis. So thank you haha. Also, I saw you wrote that you have the 6D. This really pleased me to see because it really gets a bad wrap all across the web, and seeing someone of your experience, using it, assured me i made the right choice. I recently also purchased one and absolutely love it for video. I am picking up the mosaic aliasing filter in the near future, so it should become a beast! Take care! I just bought a Rebel 3Ti on Monday as my first camera for shooting comedy sketches (and I bought the DSLR CINEMA book recommended on the site to teach me to use it). How does this compare to the Rebel 3Ti? Should I return it and buy this instead? Thanks! I personally wouldn’t. While the EOS-M is cheap and sports the same features and settings as a T3i, the body leaves something to be desired for a sole camera. I’m sure some people love it, but having a tiny camera with no dials on it when you have big hands isn’t my idea of the best camera IF you only have one camera. So this little guy lands in the 2nd/3rd camera bracket in my opinion. Thanks so much for the reply. I’m a little over my head getting behind the camera, so I appreciate the feedback (and the great resources/recommendations on this site). I agree, plus the T3i from amazon came with a lens, a free case and a free 32 gb card for a total of $529 after tax. I’m guessing I might pay more than that for the EOS-M since it’s only for the body. Thanks again! I think you made the right move. Thats what I would have done if I was in your position and it was my money. Is there any sort of an adapter so that you can use Nikon lenses on it? I am actually ordering a Panasonic Lumix G6 tomorrow and this headline really caught my eye. The larger sensor for less money is a real win, but GAH! 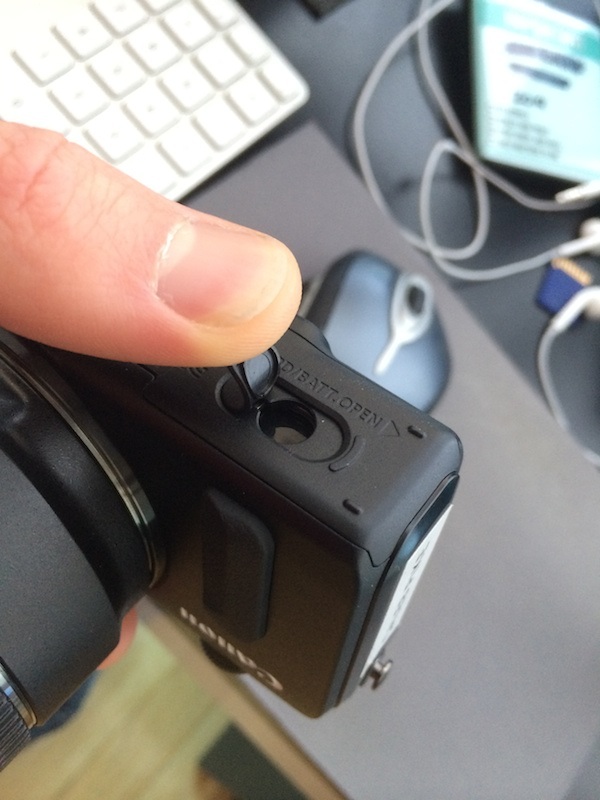 The EOS-M doesn’t have a 60fps mode out of the box. That’s a dealbreaker. Is there a hack available? I’m literally buying a G6 tomorrow. Price on Amazon just hit $498. It does have 720p 60p right? Nope, check that. By the time I could purchase it went up to $748. Also, B&H sold out. I think when Amazon gets them back in stock on the 10th of December they should go back down to $498. Yes, the EOS-M has a 720p/60fps mode. But no 1080p/60fps. Thanks for the review. I ordered one for the same reasons you expressed. How good does the adapter work? I see conflicting reviews on the FotodioX Adapter/Amazon and wanted to order it over the Canon for the obvious price difference. Thanks again for your great website! I have the adapter now, but the camera isn’t here yet (says it’s on the truck). The adapter is legit in feel, but I’ll let you know when I have the camera. Does anyone know if there’s an alternative to the touch screen for magnification? (e.g. if using a manual lens in conjunction with a loupe). Have checked out the manual and still not clear. have you tried the 22mm kit lens that comes with this? I have not. I am hoping to get one for cheap down the road though. I bought this camera from the link you have on your web site and love the camera, but it has Europe setting 25p, 70p. It does have 24p, but can I fix this with a firmware upgrade. I downloaded the 2.02 from Canon, but it not change anything… help? Never mind I figured it out… doh! Just for those who might be having the same issue, you have to change the video mode to NTSC in the menu settings. Then you’ll have 60p etc. The touch screen and the delay, with a lack of magic lantern really killed it for me, even at that price. Did they ever get magic lantern working and speed up the response time? It is an awesome price. Hmmmm……..why not……just recently got the 40mm pancake, this would really be a compact camera. I’ve got mine and just shot some podcasts with it. BOMB little camera for video. Caleb, is there a way to get 1080p 60fps? Can Magic Lantern do that? I looked in forums but couldn’t find the answer? And are you satisfied with auto focus during video? Hey Caleb, thanks for the review! I’ve been using a T3i as my A camera for some time now. Love it. I tired to use my iPhone 4s as B camera on an interview style shoot, but it really didn’t cut the cake an was impossible to make it mesh with the T3i footage.. Would the footage on this camera be comparable in terms of its “look” to the point where it would be a great B camera to a T3i? I appreacate your thoughts, thanks! I’ve used it several times by now and it would be the perfect B cam for any Canon DSLR. Pretty much has the same sensor as a T3i. I don’t think you can unfortunately. And I haven’t really used auto focus yet. Works well wit the v2 FW. The UPS man just delivered my EOS-M with the 18-55mm lens. Got it for less than $300 on Newegg. I think it’s an international version because when installing the software, it asked where I was located and only gave Asia and Oceania as options and the longer power cord isn’t the standard US configuration, but it doesn’t look like any of that matters so far. As soon as the battery charges I’m going to start testing it out. Very excited! Where do you plug in the AC Adaptor chord to the Canon EOS M? The AC cord comes with a fake battery that goes into the camera, then there is a hole for the AC cord in the battery door. Ha… I threw that away, but pilled it from the trash can… whew… thanks for the heads up on how it worked. OK, I plugged it all up, but does not work. The camera door is open, it can’t be closed due to the cord. Thoughts? The door needs to be closed. There is a small flap that you need to remove to fit the cord (see attached image). I also had a hard time figuring it out. Not instructions is silly. Thanks Caleb! I really am debating on getting another small camera for my wedding films, as I’m a lone shooter. I own a 70D (with your help!) and a Nex-5 – I picture the Nex-5 stationary, maybe wide angle, and 70D handheld, or at least with me on a tripod towards the front pew. Now I’m really interested in a third angle as I’ve seen Griffin Hammond use a GoPro for a creative, close view between the bride/groom/minister, possibly hanging above, or set on the ground below. SO NOW that I see this post, maybe this is the route to go. I’m looking for relative affordability, which this allows. 1) EOS-M: I’d be able to use my 50mm 1.4 on my 70D and the 18-135 kit lens on the EOS-M.
2) GoPro: I’d get the nicest, most future-proof one currently available, so potentially more expensive. But It would likely allow more creative shots in other settings, I shoot a lot of concerts, for instance. 3) T3i or something along those lines – Not sure this is a grand idea anymore as it seems the EOS-M has the same sensor – and a T3i couldn’t be ‘hidden’ as well in a wedding ceremony. 4) The new Canon Vixia Mini – my understanding is it’s similar to a GoPro with a wide angle lens. Although I haven’t seen much test footage of this. Only $260. I’d LOVE your feedback here… Third, affordable camera, mainly considering for wedding ceremonies… THANKS! I think the EOS-M would be fantastic. It’ll work beautifully along with your 70D. Will you be doing a full review on this camera anytime soon? I’m hoping to have it out in April. Glad to hear you’re putting out a review soon, just started looking into this camera.. I have a 60D but want a smaller camera to take with me everywhere so I shoot a lot more as DSLR is just a little too bulky. Caleb, I have a question I hope you can help with, or at least touch upon in your upcoming EOS M video. I just bought one, although won’t get it for about 10 days. I will be using it primarily for video work, just work about / day in life style things but i’d still like to be able to rig things on if needed. Any ideas of a cage suitable? Nothing crazy expensive but I have literally looked all over the internet and there is a huge lack of anyone posting about the EOS M for video work, rigs and video work solutions with the camera. I wondered if something designed for the BMPC would fit? Thanks for the reply! Looks interesting.. The GH3 is a fairly small camera, and the M looks tiny in this! what kind of video files do you get? Is there a clip length limit? And if so are the clips limited to 4gb per clip? If they are limited to 4gb are they continuous? Will they match together without dropping frames? And, does it get hot when you’re shooting a clip for a longer length of time, say half-hour or more? Also, what’s the battery life while shooting video? The files are just like the other Canon video DSLRs. And yes, their limited to 4gb BUT the camera can keep recording and will break the files into 4GB chunks that are seamless. I got the M with the 22mm lens and love it. It’s my b-cam, and the video looks great next to my t3i. It’s a little sloppy when you try to rack focus, since it’s a focus-by-wire, but for the price, I’m happy. Could you do a review on your EOS-M? Been considering getting one as a second camera for a while and am wondering how you like it. Hey Caleb, thanks for the fantastic site. I’m just getting into DSLR video and wanted an entry level option to start. 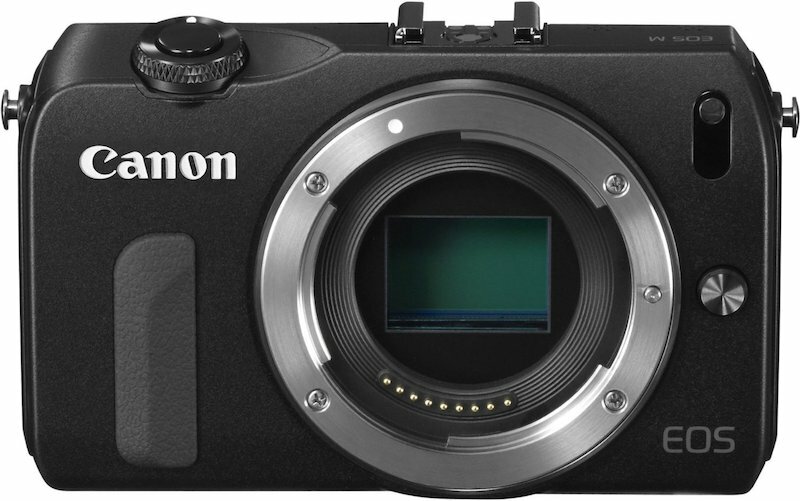 I saw your info on the EOS M and was going to get one, but it appears to be discontinued at the time of this writing, June 2015. Could not find it on the Canon site, but it is on Amazon, etc. Is there another model that you would choose instead of EOS M at this point? My thinking was that I didn’t want to put in a lot of practice in using a model will basically be a dead-end. I wanted to have a “path” to upgrade and build on my skills if I get more into DSLR videography. With that in mind, I was wondering if you still think the EOS M still makes sense.